See below for further information on upcoming events! Course request verification letters will be mailed to all rising 9th-12th grade students on Friday, April 12th. Parents/Guardians and students should review course requests carefully for accuracy. If corrections are necessary or changes are desired, including level changes, please indicate on the letter the course(s) to be added and/or dropped and return the letter with parent/guardian signature to the Battlefield Counseling Department by 3:00pm on Friday, April 26th. After this date, changes will be done only to resolve conflicts of classes or to facilitate correct placement of students due to failure of a required course. Please contact your student's counselor via e-mail if you have any questions or concerns regarding his/her course selection for the 2019-2020 school year. The Graduation Success and Beyond Newsletter will be live all school year. This newsletter was created to serve as one stop shopping for parent communication on topics related to post-secondary planning. 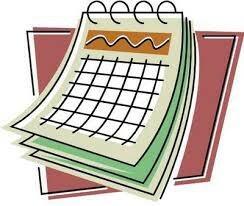 The newsletter will continually be updated throughout the year as events are held. See flyers below for the SOL remediation opportunities that are being offered after school. Dates have been set for the Prince William County Public Schools 2019 Summer School Program. Find out more information here. Did you miss the Financial Aid Information Session? Click here to view presentation. Download the PowerPoint below! View the Award Letter Comparison Worksheet. Applying to college is a complicated process, so College Board has created a program that guides you through it. It doesn't require an essay, application, or minimum GPA. Instead, it rewards your effort and initiative. Complete key steps along your path to college for a chance to earn scholarships. The College Board Opportunity Scholarships program is open to all class of 2020 students, students in the class of 2021 will be eligible next year. Click here for this great opportunity! If you know any 9th or 10th grade transfer students, who could use a Battlefield Big Brother/Big Sister, please complete the BB/BS referral form. Upperclassmen are looking to help younger students or transfer students feel connected to Battlefield. Our Bobcat volunteers aim to utilize student interests to guide their activities. Though we only have a quarter to go, there is plenty of time to make a difference for a student! The Big Brothers and Big Sisters will include parents when connecting with students email. Official SAT Practice helps students focus on exactly what they need to work on most. There are two ways to get personalized practice: Students can link their College Board and Khan Academy accounts to send their scores from the PSAT/NMSQT, PSAT 10, PSAT 8/9, or SAT; or, if students don't have scores to share, they can take diagnostic quizzes. Did you miss PSAT information Night? Click here to view a video of the presentation. Did you miss College & Career Night on 03/28/19? Download the PowerPoint and watch the embedded video of the panel discussion! The YRA program addresses the dual role of preparing students for the world of work and providing Virginia with a highly skilled workforce. Local school systems can work with business partners to identify opportunities for youth employment based upon the occupational instruction offered at the school. 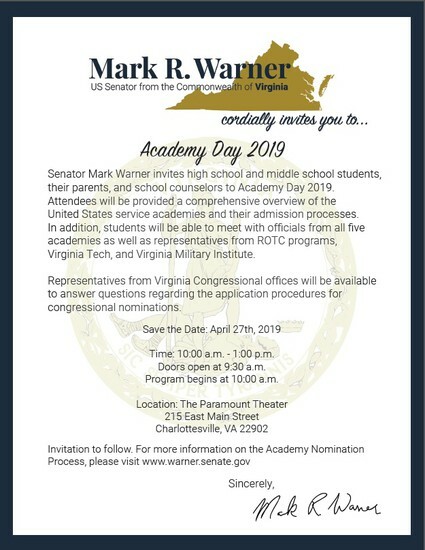 The objective of YRA is to expand the state’s skilled workforce by providing young people with career opportunities while completing their high school education. Part-time student apprenticeship is available to students where programs have been established in accordance with agreements with local public school divisions. Are you considering a career in health sciences or are interested in receiving FREE healthcare services, we can help! The Open House & Community Health Expo (April 13th) is a family-friendly event to learn what NOVA’s Medical Education Campus and the local community can offer you. Prospective students and their families can meet with NOVA students and faculty who can answer questions and help start or complete a health sciences degree or certification. Speak with academic advisors and attend information sessions on several topics, tour our state-of-the-art facility and enjoy free attractions and giveaways for the entire family. Attendees can also take advantage of free health screenings, participate in a walk-a-thon or speak with local healthcare providers and agencies about maintaining a healthy lifestyle. For additional information or questions, please contact Kristina Ogburn, NOVA-MEC High School & Community Outreach Coordinator at the information listed below. 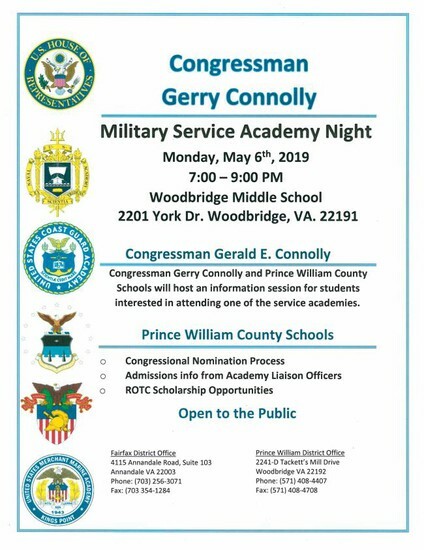 Congressman Gerald Connolly will host Military Service Academy Night on Monday, May 6, 2019, 7:00pm-9:00pm at Woodbridge Middle School. Woodbridge MS is located at 2201 York Dr, Woodbridge 22191. 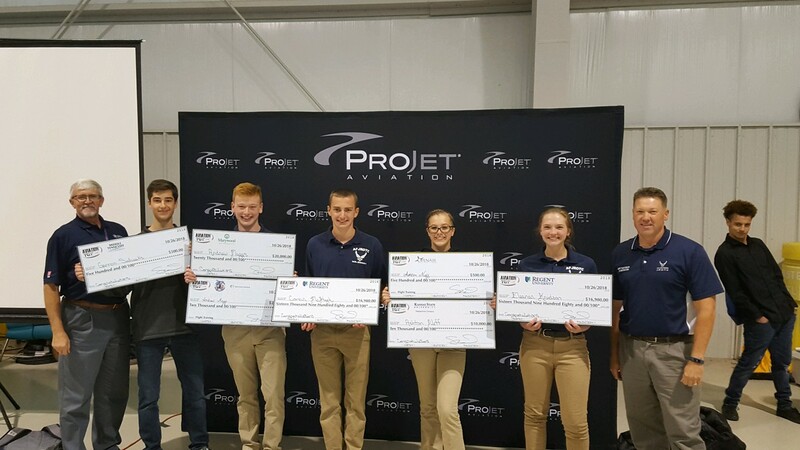 Celebrating four students who were awarded a total of $63,960 in scholarships through an essay competition at the Leesburg Aviation Expo! Way to go Gannon Sudweeks, Andrew Maggs, Connor McHugh, Ashton Neff, and Eleanor Knudson!